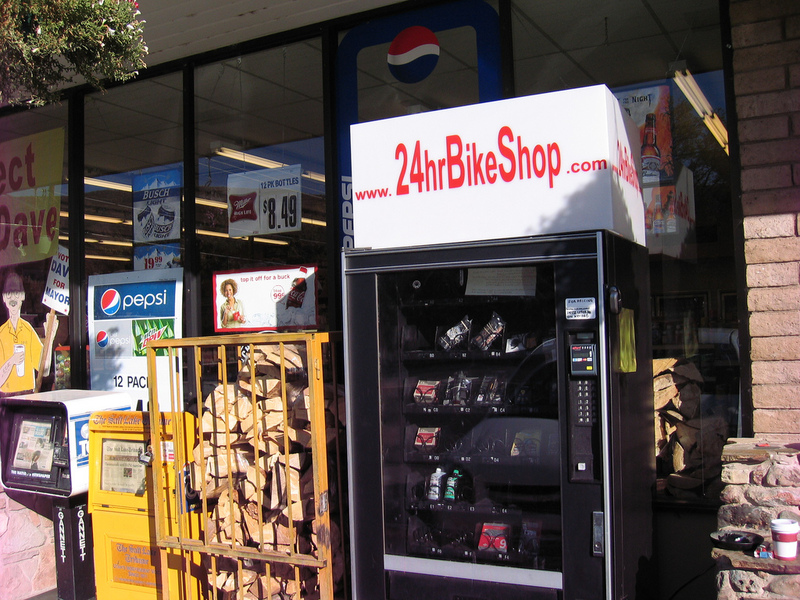 Vending machines selling emergency bike repair supplies (like this one in Moab, UT) are taking off around the country. The latest one has opened up in Williamsburg, Brooklyn. Photo: sbmilagros. After using GPS devices to track the routes of tens of millions of taxis over the past two years, New York City officials have created a database of speeds and travel routes that gives them a clear picture of the city’s traffic. U.S. Senate environment committee chairman Barbara Boxer (D-CA) declared her intention to add a version of the competitive TIGER grant program to the next long-term federal transportation bill. A study by Clean Air Network Nepal and Clean Energy Nepal reveals that pedestrian facilities in Kathmandu are in extremely poor condition. New Hampshire and Massachusetts state lawmakers turn away from the idea of highway tolling. A new U.S. Environmental Protection Agency study says redevelopment of urban centers has continued to outpace construction in the outskirts of suburbia, suggesting a “fundamental shift” in the real estate market. For the third time, a $2,200 Tata Nano burst into flames – this time in Mumbai, less than an hour after the new owner left the dealership (he and his son escaped unharmed). Detroit Mayor Dave Bing delivered his first “state of the city” speech, highlighting proposals that could revision the struggling city including the demolition of up to 10,000 derelict and abandoned homes over the next three years and a land-use plan that will downsize the city to reflect its population decline. The fifth World Urban Forum, a global event organized by UN-Habitat, began this week in Rio de Janeiro. More than 21,000 delegates from around the world came to discuss the role of cities can play in sustainable development. Communities around the world are joining the Transition movement, catalyzing local initiatives that promote resilience and “reskilling” to prepare for peak oil and climate change. The land underneath a Toronto highway overpass will be converted into a neighborhood park, hopefully sparking the revival of an underused waterfront neighborhood. This New York Times Magazine photo spread depicts extreme home makeovers involving the conversions of shipping containers, salvaged material from Boston’s Big Dig, water towers, and even caves into housing. The new iSpotSwap iPhone app allows motorists to track down open parking spots and tell others when they’re vacating a spot, which can save fuel and emissions. A new study finds that the impact of one million electric cars on the electricity grid would be minimal if charging were scattered over 8-12 hours. A vending machine for cyclists opens up in Williamsburg, Brooklyn, carrying tire patch kits, pumps, brake pads, small U-locks, and other items needed for a quick repair.